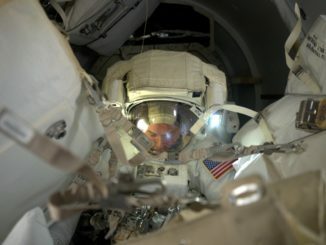 Astronauts Barry “Butch” Wilmore and Terry Virts floated outside the International Space Station Wednesday for the second of three spacewalks to help ready the lab complex for dockings by commercial crew capsules being built by Boeing and SpaceX. Back inside the station’s airlock, Virts reported a small amount of water in his space helmet, but officials said he was never in any danger. Even so, given a near-catastrophic helmet leak in July 2013, engineers will need to troubleshoot the latest issue to make sure the suit’s internal systems are healthy enough for Virts and Wilmore to carry out a third planned spacewalk Sunday. The problem was not noticed until Wilmore and Virts had returned to the station’s airlock at the end of a successful six-hour 43-minute excursion. Along with a small blob of cold water floating in his helmet, Virts reported a water absorption pad at the back of the helmet, one of several safety measures implemented in the wake of the 2013 incident, was wet. A few minutes later, she said the pad was moist, but not saturated, possibly indicating the water flow did not begin until very late in the spacewalk. The frightening 2013 water intrusion was caused by clogged pores in an internal filter, but it was not immediately known what might have caused the problem Wednesday. Virt’s suit, serial number 3005, experienced a similar water intrusion after a spacewalk in December 2013, one of two that followed the much more serious incident the previous July. The December incident occurred at about the same time as the one Wednesday, when the airlock’s pressure was holding at 5 pounds per square inch for routine post-spacewalk leak checks. How that timing might play into the troubleshooting was not known. 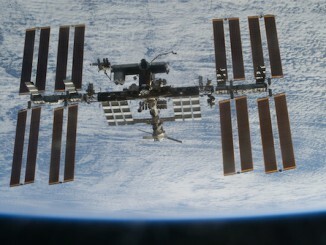 The issue will be reviewed during an already planned space station Mission Management Team meeting Friday. The spacewalk began at 6:51 a.m. EST (GMT-5) and ended six hours and 43 minutes later, at 1:34 p.m., when the astronauts began repressurizing the station’s Quest airlock. During a six-hour 41 minute EVA Saturday, Wilmore and Virts laid out eight bundles of cables near the front of the space station that will supply power and data to new docking port mechanisms that will be launched and installed later this year. During Wednesday’s outing, they first removed a protective cover from a docking port extension on the front end of the space station that was once used by visiting space shuttles. The cover turned out to be fairly stiff, but the astronauts managed to stuff it in a stowage bag as planned. “Hey Joe, please don’t ask us how we did it,” Virts joked with astronaut Joe Acaba in mission control. “I tell you what, I wish I had a video of it,” Wilmore said. “That was the ‘stuff your sleeping bag in the bag in the morning’ technique,” Virts quipped. 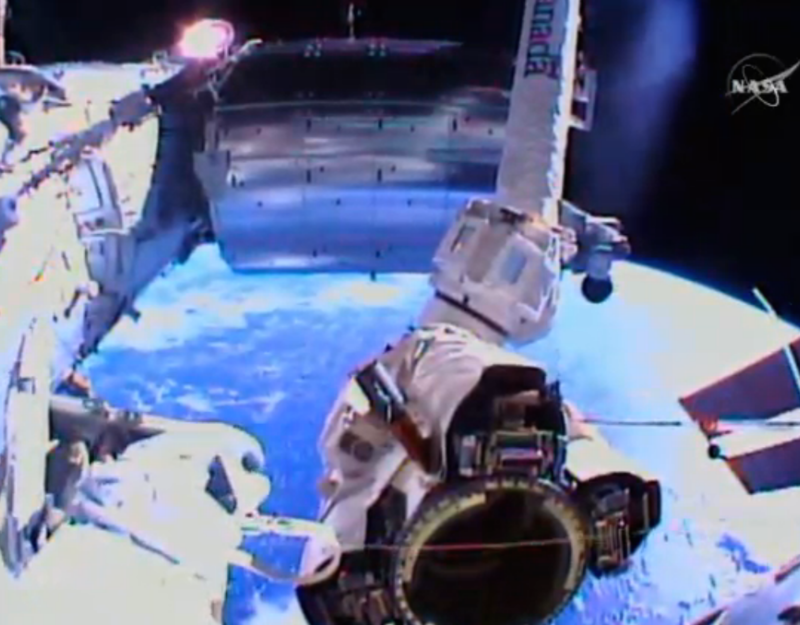 The spacewalkers then stowed no-longer-needed shuttle power cables that were disconnected Saturday before installing two final sets of power and data cables needed by the docking mechanisms. During a brief lull in the work, Wilmore took a moment to marvel at the view as the station passed 257 miles above the northeast coast of South America. “That is a good view,” Virts agreed. “It’s a color of blue I’ve never seen before, that’s for sure,” Virts said. 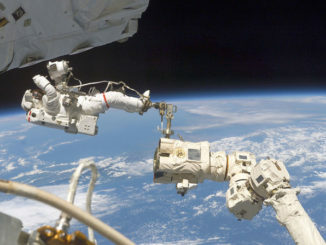 Virts spent more than two hours lubricating the intricate capture mechanisms on the end of the station’s Canadian-built robot arm. Using a long tool known as a BLT, for ball-screw lubricating tool, Virts applied the grease to internal components in a bid to reduce friction in the mechanism when the capture systems are activated. 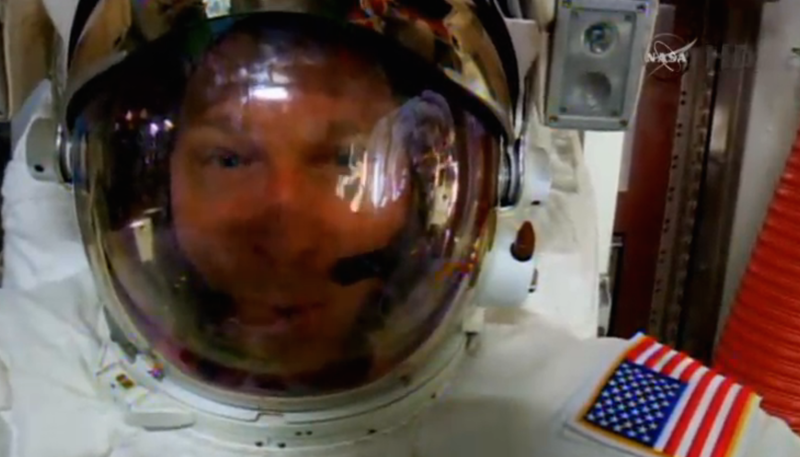 “Nor a clean tool,” observed Acaba, watching the slightly messy work through Virts’ helmetcam. “No, it’s not,” Virts replied. While that work was going on, Wilmore worked on the left side of the station around the Tranquility module, making preparations for upcoming module relocations. He removed a protruding valve and a handrail to improve clearances for one of the module moves and released launch locks on Tranquility’s forward and aft berthing ports. The astronauts ran ahead of schedule throughout the spacewalk, leaving time at the end to accomplish a few additional tasks to get a head start on their third spacewalk Sunday, assuming it stays on schedule. The goal of that excursion is to install antennas and associated cabling to permit communications with approaching and departing U.S. crew ferry capsules. Initial test flights are expected in 2017. By the end of their third EVA, Wilmore and Virts will have laid out and connected multiple cable bundles stretching some 670 feet. At least four additional spacewalks are planned later this year to complete the most extensive space station reconfiguration since the end of the shuttle era in 2011. Nearly 900 hours of crew time will be required for the spacewalks, robotic activity and work inside the station to ready the lab for arrivals and departures of Boeing’s CST-100 ferry craft and SpaceX’s piloted Dragon capsule. The new International Docking Adapters, or IDAs, are tentatively scheduled for launch aboard SpaceX Dragon cargo ships in June and December respectively. One will be attached to Pressurized Mating Adapter No. 2, the docking port extension on the front end of the forward Harmony module where Wilmore and Virts worked Wednesday to remove its protective cover. Before the second IDA can be installed, the station’s robot arm will be used to move a storage compartment known as the Permanent Multipurpose Module, or PMM, from the Earth-facing port of the central Unity module to the forward port of the nearby Tranquility compartment. The Unity port will then be available for use by unpiloted cargo ships. The PMM move is targeted for the June timeframe. Pressurized Mating Adapter No. 3, the docking port extension needed by the second docking mechanism, is currently attached Tranquility’s outboard port. It will be moved to the upper port of the Harmony module in October. Around the same time, another SpaceX cargo ship will bring up an inflatable module built by Bigelow Aerospace that will be attached to Tranquility’s aft-facing port. The Bigelow Expandable Activity Module, or BEAM, will remain in place for two years as a technology demonstration project. During Wednesday’s spacewalk, Wilmore’s tasks included work to prepare common berthing mechanisms on Tranquility’s forward and aft ports where the PMM and BEAM modules will be attached later. After the PMM and PMA-3 relocations, the second International Docking Adapter will be launched in the December timeframe aboard another Dragon cargo ship. It will be robotically attached to the end of PMA-3 atop Harmony. At that point, the International Space Station will have two ports for dockings by either Boeing or SpaceX crew capsules and two other ports for use by unpiloted cargo ships. All in all, some 880 hours of crew time will be needed to prepare for and carry out the seven planned NASA spacewalks, to install internal wiring and for the robot arm operations to install the docking adapters and relocate the PMM and PMA-3. Wednesday’s spacewalk was the 186th devoted to station assembly and maintenance since construction began in 1998, the second of nine planned for this year (including a Russian EVA), the third for Wilmore and the second for Virts. Going into today’s EVA, 120 astronauts and cosmonauts had logged 1,165 hours and 51 minutes of station spacewalk time, or 48.6 days.